Discussion in 'Frugal Living - Making and Saving Money' started by CrealCritter, Nov 10, 2018. Every year we plastic over the screens on our screened in porch. We also have a blue flame propane wall heater out there to supplement heat at night when we want to sit on the porch. Today it's currently 32 degrees and sunny, since the porch faces south it collects solar heat. Even with it being 32 outside, it's approaching 70 (or 20C for Sumi) on the porch and I'm warm even wearing wife beater. Sunny days are great, we leave the front door open and draw the heat off the porch with our furnace fan and circulate the warm air from the porch throughout the house. Nice... and about as cheap as you can get for heat anyways. Wow, that sounds like it's working great! CC, we did that every winter when I was growing up. Our porch then extended the entire length of the south end of the house. We often opened the door and living room windows and let the heat from the porch into the house during the daytime. Beekissed, sumi and CrealCritter like this. sumi, CrealCritter and milkmansdaughter like this. 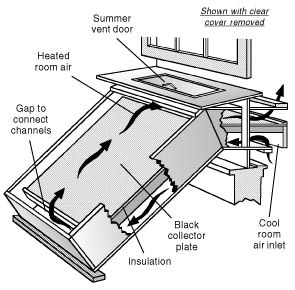 Yeah - it's a great "hack" to supplement your heat bill. However here in the Midwest, sunny days are few and far in-between during the winter months. In order for it to be effective, the sun must shine. tortoise, sumi and CrealCritter like this. CC, I grew up in Wisconsin, and that's where we used the plastic on the porch. Maybe we had more sunny days than you do where you are. We were close to Lake Michigan and seemed to have a lot of sunny if short winter days. The way the old house was built, the porch ran the entire length on the south side. The porch was about 5 steps up from the ground, and we shoveled snow up around the base to keep cold air from circulating under the porch and to help with insulation. Looking at the front of the house, a door went into the house from the porch. This door led directly to an open staircase that went upstairs, and to a short hallway along the stairwell straight to the kitchen. To the right of the hall was the living room with two windows that opened to the porch. So even if every day wasn't sunny, the days that were really helped. There was a second door from the kitchen to a second small porch with space for boots jackets, hats, gloves, etc. Having both entrances buffered with porches really helped keep some of that cold air out. Add that to a kitchen with an oven on cooking a roast or a meatloaf or a big pot on the stove making soup, and we had a warm house perfect for kids coming in from the cold. My parents have a screen porch off the back of their house - between the house and the garage. My dad made frames to fit inside the framing for the screen areas and covered those with 6 mil plastic. He puts those in every fall and removes them in the spring. It keeps that porch snow and wind free and warm enough on the sunny winter days to hand clothes to dry. I have covered drafty windows with plastic before, but am not willing to plastic up the porch. If I did, I wouldn't be able to see outside.